Earn up to 1,100 reward points. An innovative moving solution for musicians. This RocknRoller package includes the RocknRoller R8RT Mid Multi-Cart and the RSD10 Solid Deck Kit. The RockNRoller R8RT Micro Multi-Cart moves an amazing amount of gear. This professional equipment cart is the world's most innovative moving machine. The RockNRoller R8RT Multi-Cart has a frame expands and unfolds to accommodate innumerable cargo types and instantly transforms Into any of 8 configurations. As a 2-wheel handtruck it has a long nose and stairclimbers to slide bulky equipment over stairs and curbs. As a short platform the R8RT makes a great amp or speaker stand and also works great as a tool truck for sound, lighting and video technicians. The Long hi-stacker configuration moves full drum kits with ease. Odd-shaped cargo is not a problem. The R8RT folds small enough to even fit in suitcases then unfold and expand at airports to carry all your gear. The RocknRoller Multi-Cart R8RT has a rugged frame that telescopes from 35"-52" in length with 24" foldable sides, 8" x 2.5" R-Trac rear wheels and 5" x 1.25" front swivel casters with brake. Load capacity: 500 lbs./32 cubic ft. Weight: 29 lbs. 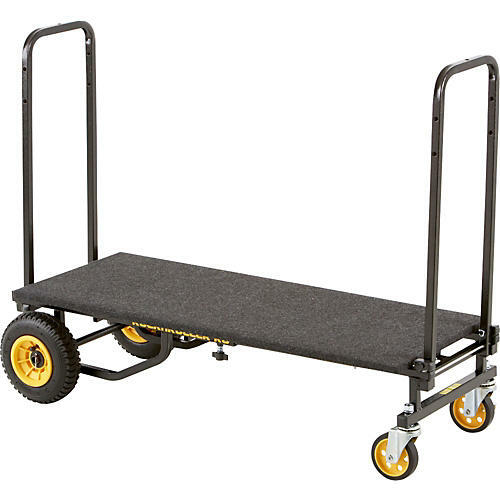 Critically acclaimed RocknRoller Multi-Cart equipment transporters vastly reduce the time and effort of moving equipment. The patented design instantly transforms into 8 different configurations to fit any equipment size or shape, replacing the need for 8 different carts. These Multi-carts quickly and ergonomically move huge amounts of gear yet fold small for storage. They are so innovative, they're even featured in college engineering textbooks for outstanding design. Each Multi-Cart features a strong, steel tube frame with a powder coated textured finish to resist load slippage. The RocknRoller Multi-Cart RSD10 Solid Deck is a 2-piece, carpeted, 1/2" plywood deck that attaches and locks into place to prevent small items from falling through the frame bed on either the R8, R10 or R12 RocknRoller Multi-Cart. Can be used as long (18"x50") or short ("18"x30") solid deck and stores small for easy transport. R-Trac wheels feature pneumatic-like ride, light weight, low rolling resistance and no air loss. Save your back! Order today. Load Capacity: 500 lb. / 27 cu. ft.